Becoming a mom was the best thing that ever happened to me. But that doesn’t mean it wasn’t hard. On the contrary, I think it was precisely because I took motherhood so very seriously that I found it so difficult. I wanted to be good, really good, at being a mom, but instead I struggled. I struggled with the lack of sleep, with the lack of alone time and quiet, with the way my whole schedule had been turned upside down… But mostly I struggled with self-doubt, with the sense that I wasn’t good enough for this challenge, that I wasn’t doing everything—or anything—right. At the same time, I found myself struggling to reach God. The conditions that I’d felt I needed to connect with God—quiet and time to myself—didn’t seem to exist in my new life as a mom. Yet as I was confronted with my own limits—my impatience, my exhaustion, my own selfishness—I needed God more than ever. So I set out to learn how to reach God in my new life as a mother through a year in which I focused on ten different spiritual practices: prayer, fellowship, submission, study, simplicity, service, silence, fasting, worship, and celebration. Some of the disciplines proved more difficult than I had imagined: I failed miserably to meet my study goal! But I gained valuable insights about all the disciplines I attempted. For example, I discovered some different ways and times of day to pray, rediscovered some new ways to practice service, and started to re-imagine some of my daily life with my son as worship. Perhaps the most surprisingly effective practice was simplicity. I realized that my tendency was to seek God by piling spiritual tasks onto my to-do list—staying up late to carve out extra time for prayer, reading through five books of the Bible, etc. Yet many of my most meaningful times of meeting God came when I instead subtracted things from my life through practices like silence, fasting, and simplicity. Throughout it all I also learned to give myself a little more grace about not being perfect all the time. Most importantly, I discovered that motherhood itself shifted my focus from myself—what I wanted, what I needed, what I thought would make me happy—onto another person and what he wanted, what he needed, how I could make him happy. For me, the conscious practice of parenting was perhaps the most effective discipline of all. 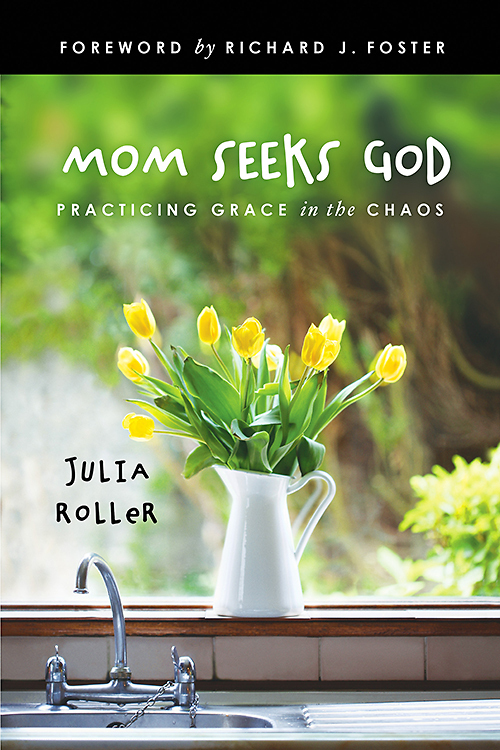 Julia’s new book, Mom Seeks God, is the story of her journey through her ten practices, including her “non-expert” tips on how other busy moms can connect to God. If you’re a mom or just find yourself struggling to find the time for prayer and other ways of meeting God in your daily life, please check out Mom Seeks God. Books are available at http://www.juliaroller.com. Giveaway: Comment on this post or on the Practicing Families Facebook page and you’ll be entered into a raffle for a free copy of Mom Seeks God. The winning entry will be selected by April 15. Make sure we can contact you to get your mailing address! Previous post ← Why do YOU have to go to Church? Sounds like a wonderful book. Will have to put this on my to-read list. Congratulations on your book, Julia! I would add that, for women, responsibility for one’s own body sometimes takes last place. I always appreciate when mothers can be honest and share struggles that all mothers experience. God’s grace is there for each of us! I sure hope to find some time to read this book soon. Hey julia, what I just read was great and I would love to read the whole book. You have been a great friend to me. Love that, Vaniti, especially the image of God and Tytus watching over you from the sky every night as you drove home from the hospital. I know that was a tremendously hard time. So glad he’s doing so well now!